Reusable recycling bags are to tenants of multi-family homes and apartment complexes what recycling bins are to single-family homes. The simplicity of the design streamlines the process, saves on space, stands up to regular use, and is completely customizable to fit the needs of different property management facilities or municipalities while also providing a cost-effective solution. By making the process easy for residents of single-family homes, curbside recycling programs are proven to effectively increase recycling rates. This ease and convenience does not translate to multi-family homes, apartment complexes, dorms and similar living situations. When recycling is not easy, people do not recycle. A simple bag is about to change recycling for tenants by providing all of the convenience of the curbside bin system without the hassle. Find out the five ways reusable recycling bags make recycling easy for tenants. Recycling bins are bulky and take up a lot of space. For many homeowners, especially those with a garage, these large bins are not a problem. Apartments tend to have less space, particularly utility space, like a garage. Simply having a garage is not really a solution to the recycling dilemma faced by tenants. For those apartments dwellers who are fortunate enough to have a garage, this space may not be conveniently located, making it ineffective for rounding up recyclables and storing a bin. A handle on the bottom of the bag makes emptying recyclables easy. Photos courtesy of Factory Direct Promos. 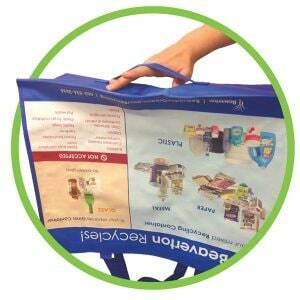 Reusable recycling bags offer the ability to round up recyclables, without the space necessary for a bin. Recycling bags are lightweight and compact. These bags are generally about the same size as a standard reusable grocery bag. Recycling bags can easily be hung on a coat rack or from a hook in a pantry or closet, keeping them close by, but not in the way. The ability to hang these bags and get them up off of the floor helps to save on space and makes them ideal for smaller spaces. Perhaps the reason reusable recycling bags are so effective is the simplicity of the design. Reusable recycling bags can be used to collect bottles, jars, cans, magazines and more until the bag is full or until the resident has time to empty the bag. When a tenant decides to empty their recycling bag, they can dump the contents into a conveniently located, community collection bin. By making the process easy, tenants are more likely to participate in a recycling program. The reusable recycling bag solution gives tenants the ability to sort and collect items for recycling in a way that is easy for them. There is no need for residents to constantly run to the collection bin every time they have an empty can or yogurt cup. At the same time, the bag makes it easy to carry multiple items. The bag also maintains a neat appearance in the home and contains everything until the tenant decides to empty the bag at a building-wide collection point. Reusable recycling bags are built to last, using heavy-weight fabric made from recycled content. The construction is watertight to contain spills and messes, so if water, sauce, gravy or anything else ends up in the bag, it will not seep through and leak. The mess will be contained inside the bag and not spread to the home. Reusable recycling bags can be rinsed clean in a sink or wiped down with a damp cloth if food residue leaks or spills onto the bags. The long handles can be worn on a shoulder for convenient hands-free carrying; this is especially helpful if a resident has other items to carry, like a full garbage bag or broken-down boxes that are too big to fit in the bag. A handle located on the bottom of the bag makes it easy to dump the contents into a recycling bin and ensures every last item falls out of the bag. Ultimately, the way residents use and care for their reusable recycling bags will dictate how well the bags hold up and how long they last. Given regular use, one bag can last for six or more years. These bags are made from recycled content, making them an eco-friendly solution, but when the time comes and these bags eventually wear out, they can be recycled, too. 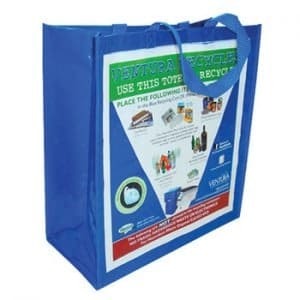 Reusable recycling bags can be fully customized to fit your specifications. Give the bags a unique look to help them stand out and make it easy for residents to locate them or include useful information by printing custom artwork directly on these bags. For example, include a list of items that can be recycled to help residents understand the codes located on some containers. Include contact info for the waste management organization or property management office. Do not worry about running out of space, as all surfaces of the bag can accept printing, including the bottom and inside to help relay all of the necessary information. Full-color printing supports detailed artwork and helps ensure your message is seen while providing a cost-effective alternative to screen printing. Everything about these bags can be customized—from adjusting the handle length to altering the size of the gussets. Any change you want to incorporate into the design is possible. Customizing these reusable recycling bags enables them to function well for tenants. Making the bags useful and informative will increase the likelihood of tenants reaching for these bags when they have items to recycle. The level of customization will determine the final cost, but reusable recycling bags can cost as little as $0.89 per bag. Redesigning the structure of the bag to alter the dimensions, changing the material or making any other modifications will impact the price. However, making these changes will improve the function and usability of the bag, which will increase the odds of tenants using these bags and recycling. Reusable recycling bags are still a cost-effective solution when compared to traditional recycling bins. Quantity is an important factor to consider when ordering your reusable recycling bags. Increasing the quantity can lower the price per item and allow you to land a great deal on these bags while still taking advantage of the ability to customize the final result. When customizing the design or purchasing large quantities make sure to order far enough out to ensure that you will have your bags by the time you need them. Creating a completely new bag to fit your design specifications or ordering large quantities can require additional production time of a month or more. Reusable recycling bags are to tenants of multi-family homes and apartment complexes what recycling bins are to single-family homes. By simplifying the process, tenants are more likely to recycle. The simplicity of the design streamlines the process, saves on space, stands up to regular use, and is completely customizable to fit the needs of different property management facilities or municipalities while also providing a cost-effective solution. Beth Wilkerson is Operations Manager for Factory Direct Promos (Coral Springs, FL), a leading U.S. based manufacturer of custom reusable bags. Factory Direct Promos has an almost three-decade history of offering factory direct pricing, customization and innovation in the manufacture of reusable bags. Beth can be reached at Beth@factorydirectpromos.com.